LOUISVILLE, Ky.--(BUSINESS WIRE)--People with a debilitating and painful disease have a new treatment option available to them thanks to the collaborative efforts of Jewish Hospital, the University of Louisville and the University of Louisville Physicians. 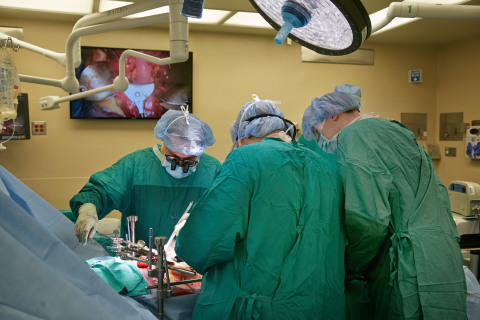 Jewish Hospital, a part of KentuckyOne Health, and faculty members from the UofL School of Medicine are providing total pancreatectomy with islet cell auto-transplantation for some patients with chronic pancreatitis. Since the start of the year, six patients have undergone the procedure and all have functioning islet cells. The program is funded by an $800,000 grant from the Jewish Heritage Fund for Excellence. Chronic pancreatitis, inflammation of the pancreas, can only be cured with complete removal of the pancreas (total pancreatectomy). However, removing the entire pancreas creates diabetes that is extremely difficult to control, with alternating very high and dangerous, life-threatening low blood sugars. Therefore, only a portion of the pancreas typically is removed in an attempt to prevent post-operative diabetes. This treatment does not very effectively treat the episodes of pain that lead to recurrent hospital admissions for patients with chronic pancreatitis. The total pancreatectomy with auto-transplantation of islet cells from the pancreas is an alternative treatment being performed by a handful of facilities around the world, including Jewish Hospital. This procedure involves complete removal of the pancreas. 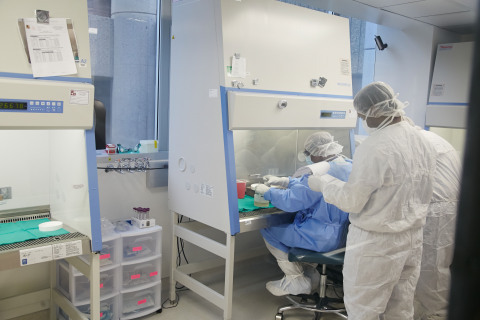 The patient’s islet cells are isolated in a “cleanroom” facility at the Cardiovascular Innovation Institute (a partnership between UofL and the Jewish Heritage Fund for Excellence) and then re-implanted into the patient to prevent diabetes. Most patients who have had total pancreatectomy with islet auto-transplantation find a dramatic lessening of abdominal pain, reduction in the use of narcotic pain medicine and improved blood sugar control. Since the process involves the re-implantation of the patient’s own cells, the patient does not have to take immunosuppressive medication to ensure the viability of the treatment. According to Dr. Hughes, in addition to helping patients with chronic pancreatitis, the auto-transplantation of pancreas islet cells has the potential to impact people with type 1 diabetes. The techniques and skills acquired in auto-transplantation may be applied to patients with diabetes in the future. The Jewish Heritage Fund for Excellence grant has funded the creation of the islet cell auto-transplant program at Jewish Hospital. The Jewish Heritage Fund for Excellence provides financial assistance to not-for-profit organizations offering programs focused on Jewish culture/identity, health, human services and education. Editor’s Note: Referring physicians or patients with chronic pancreatitis can learn more about the procedure by calling 502.407.3220. The University of Louisville Health Sciences Center is the city’s only academic health center. Approximately 1,000 faculty members are involved in education, research and clinical care. The UofL HSC is home to more than 650 medical and dental residents, 3,000 students pursuing degrees in health-related fields within the Schools of Dentistry, Medicine, Nursing and Public Health and Information Sciences, as well as 14 interdisciplinary centers and institutes. Approximately $140 million in extramural funding enables researchers to uncover the causes of disease and better ways to prevent, treat and cure those diseases. Patients are seen at the Ambulatory Care Building, The James Graham Brown Cancer Center, the UofL Physicians Outpatient Center, Kosair Children’s Hospital and University of Louisville Hospital. University of Louisville Physicians is the largest multispecialty physician practice in the Louisville region, with nearly 600 primary care and specialty physicians in more than 78 specialties and subspecialties. Our doctors are the professors and researchers of the University of Louisville School of Medicine, teaching tomorrow’s physicians and leading research into medical advancements. For more information, visit www.uoflphysicians.com. KentuckyOne Health physicians in Louisville perform ground breaking islet cell auto-transplantation treatment for patients with chronic pancreatitis.